Hmmm. I inherited some of these from an elementary library, and the WWII ine also had some deaths. I don't care much for the choose-your-own format, since I feel compelled to do every combination, and I like the deaths even less. No denying the appeal for the lityle war mongering boys, who have been around for years! Interesting review. My son loves the choose-your own adventure books. I'm not sure how he'd feel about this one. 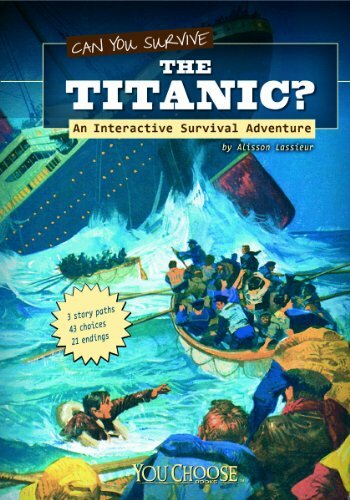 Given that most kids my generation learned about the Titanic from the song that included the cheerful lyric "husbands and wives, little children lost their lives" I have to disagree that its a 'new' thing to expose children to the deaths. Maybe the new squeamishness can't take it, though. Like Ms Yingling I have to read achieve every combination so I don't seek the choose-your-adventures out. I don't think it's any more voyouristic than the "You Were There" series that I gobbled up as a kid. Interesting idea for a book. We went to the Titanic exhibition when it was at the British Columbia museum. I was surprised that life jackets consisted of thin material stuffed with cork.